If you have just made the pineapple flowers and are looking for something to do with them- then you’re in the right place. 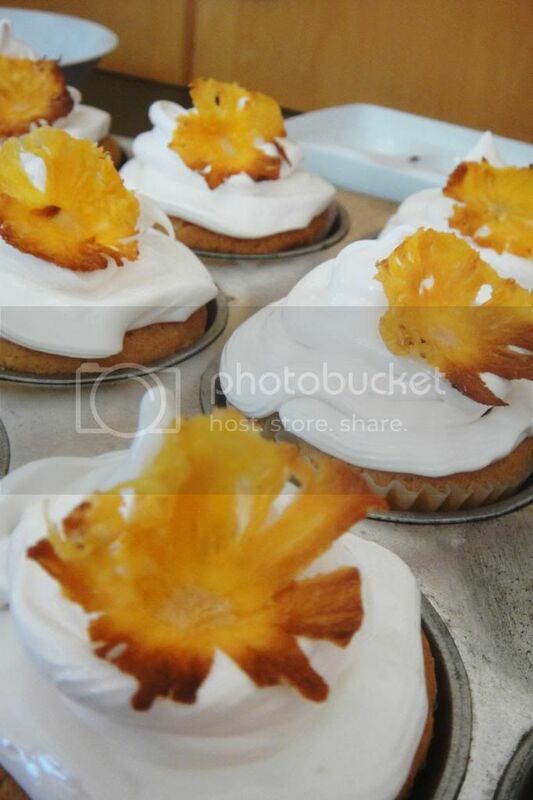 If you need to learn how to make the flowers- kindly click HERE and come back to these cupcakes once you’ve done so. These cupcakes are beautiful- and this was the first time I tried them and they worked out wonderfully. 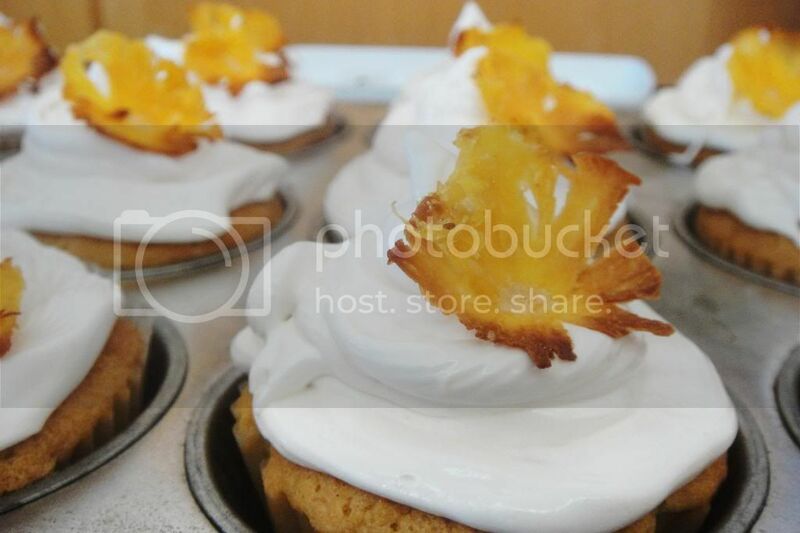 The soft gooey meringue icing works fantastic with the sweet slightly caramelised tasting pineapple- delicious! And the best part? They look much more impressive than they actually are! These cupcakes are super easy- get all the ingredients and throw them in the blender- DONE. Okay- it’s easy, but not that easy. First set your oven to 200 C. If you have a fan plus option on your oven- set your oven to 180 C. Then take all the ingredients EXCEPT the milk. Put those ingredients in the blender and blitz until all mixed together. Then add your 3 tbsp Milk-blitz until properly mixed in. And Voila! Cupcake batter done! So easy! and the best part is- no sifting needed!! 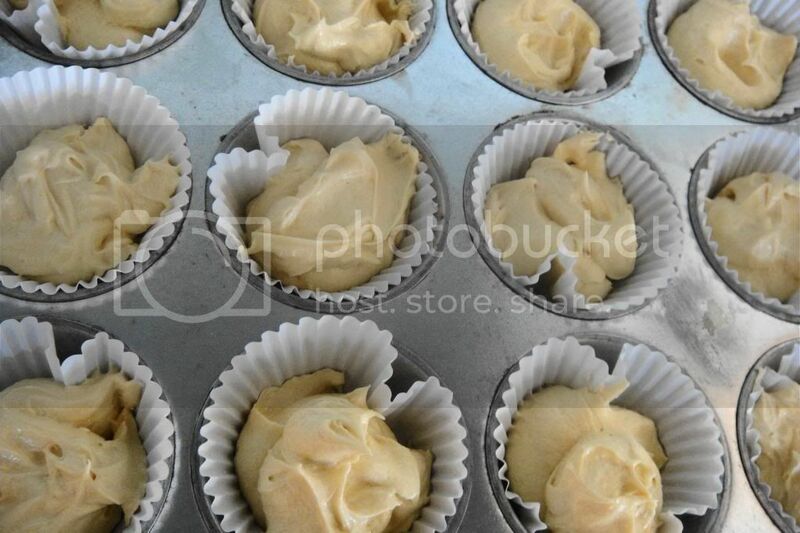 Then spoon the batter into 12 cupcake cases. Place your cupcake cases in the oven for 15-20 minutes. Mine needed 20 minutes- but I would recommend setting a timer for 15 minutes- and checking whether they are ready. To check if they’re ready you simply push a knife through the middle of the cupcakes- if it comes out clean- they are ready! Now here is what you do- be careful to follow these instructions exactly! Place the egg whites, sugar and salt in bowl which you place over a pot of simmering water. Do NOT put the mixture over the pot until the water is simmering- otherwise it will not work! Now you need to whisk the egg white mixture over the simmering water until the sugar has dissolved and the mixture is warm to the touch- this takes about 5 minutes. Set a timer for 5 minutes- and do not stop whisking until it pings. 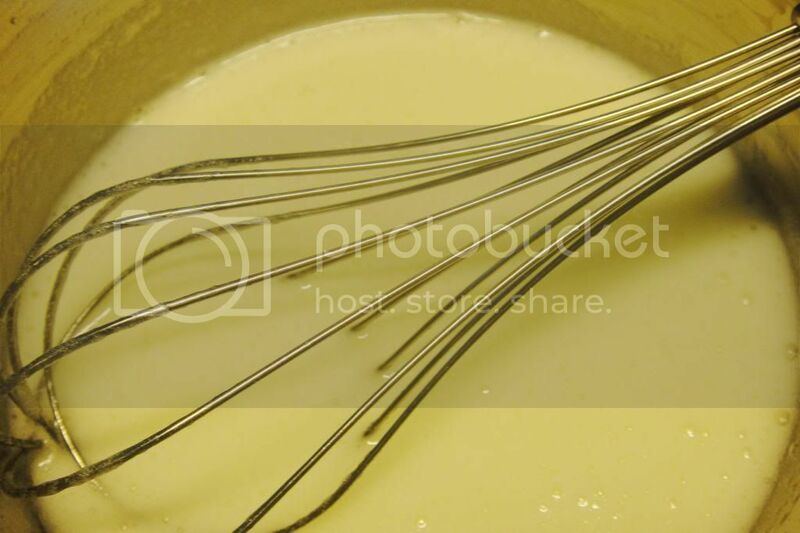 Then pour the mixture into either a bowl and beat with an electric whisk or into your food mixer for 3minutes. Turn either of these up to their highest settings- and as you’re continuously beating for those 3 minutes pour the vanilla in. 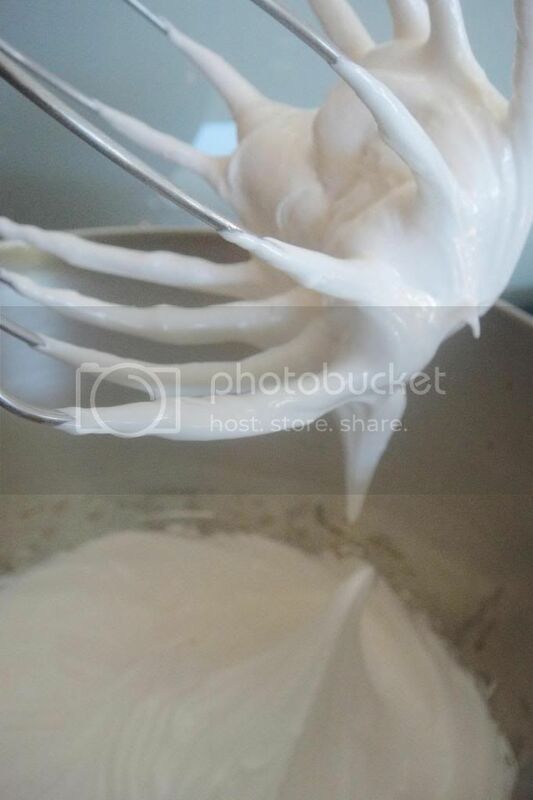 After 3 minutes your mixture will be light and fluffy and should be able to form stiff peaks. I used a piping bag (because its my new toy) but it isn’t necessary. 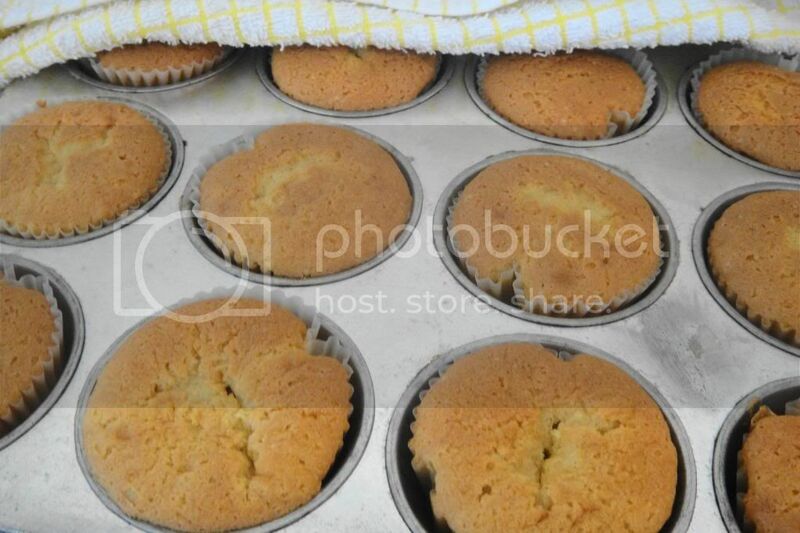 You can easily spoon the mixture on to the cupcakes because it is so soft and easy to work with. 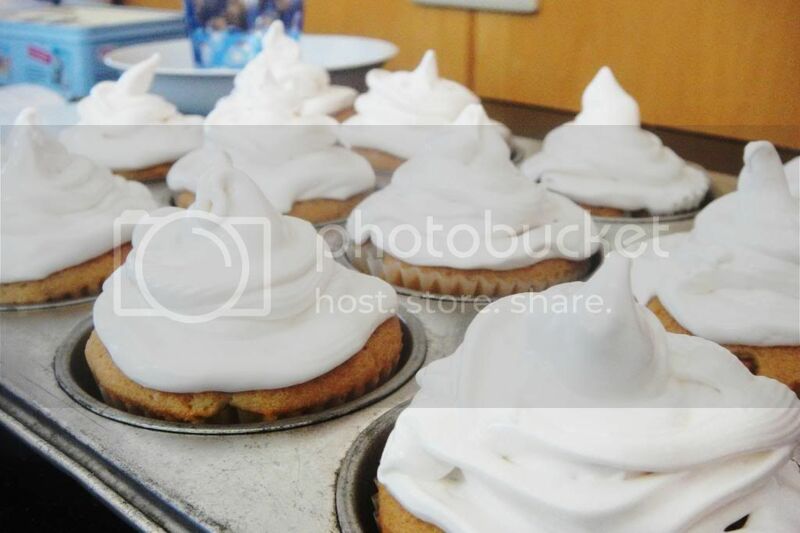 I piped nice big towers of the meringue icing- and as big as I piped them I still got requests for more! This icing is truly delicious and gourmet! 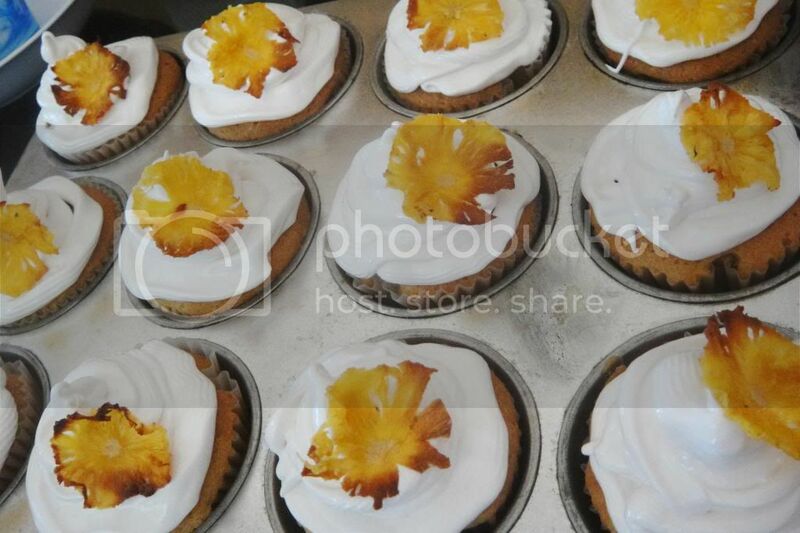 I then placed my pretty little pineapple flowers on the cupcakes and an angle- and that’s it- done and dusted- and oh so beautiful! I hope you enjoy them and receive plenty of compliments!